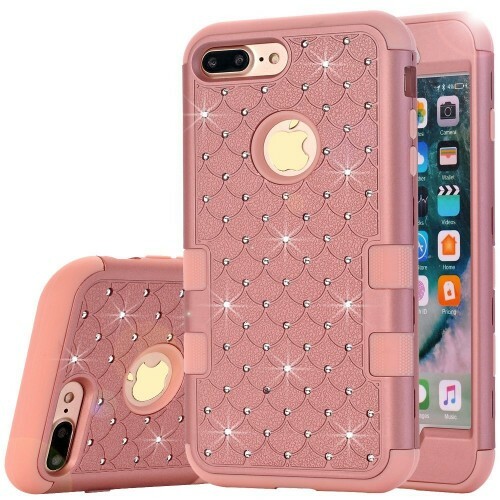 â–¶[COMPATIBILITY]: Only fit iphone 7 plus/iphone 8 plus 5.5 inch smartphones all carriers(at&t,verizon,t-mobile,Sprint,Unlocked)..Apple iPhone 7 Plus Case is aslo Compatible with Apple iPhone 8 Plus. â–¶[PRECISELY CUT]: New iPhone 7 plus /8 plus 5.5 inch Case Provide Precise Cutouts for Speakers, Microphones, Cameras, Charging Port, Audio Port and Buttons for Your Apple iPhone 7 plus /7s plus 5.5 inch . No Hassles. No Headaches. â–¶[SHOCK PROTECTION&PRETTY DESIGN]: Made of Hard Plastic and soft inner silicon to protect your phone from impact,drop, and shock. 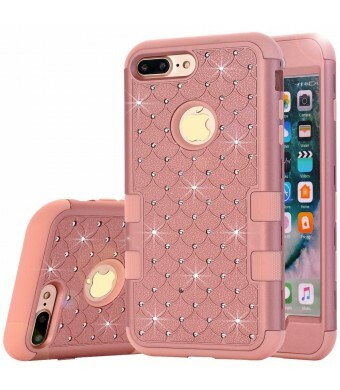 2 in 1 Bling mermaids scale hard shell case cover skin will make you outstanding in the crowd! â–¶[WARRANTY]: 30 days free replacement or refund !Does not come with built in screen protector! We recommend you use one pc or glass screen protector to provide more protection for your touch screen.